Increase your immunity. This pure herb extract aids in the prevention and treatment of the common cold, flu and mild and moderate infections. Capsule contents can be dissolved in water and used as an antiseptic wash for mouth and gum infections. Derived from three year old Echinacea Purpurea. May help increase your immunity. Only the roots of three year old Echinacea plants are used. 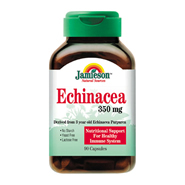 Jamieson Echinacea Purpurea 350mg provides nutritional support for a healthy immune system, especially during times of stress, allergy and heay fever season. Each capsule contains: Echinacea purpurea (1:3 powdered extract) 350mg.